Copy Monthly Events. Easily add events to your calendar that are on the "second Thursday of the month" or the "last Tuesday of the month". Finalize attendance when you take attendance for campouts and meetings. Webelos and Arrow of Light scouts can be separated into different dens, making it easier to sign off on adventures and badges. Authorize merit badge counselors to add merit badges for scouts and to sign off on requirements for scouts not assigned to them. Boy Scout rank status reports now show Weeks To 18 instead of date of birth. WYSIWYG editor (CKEditor) for composing Announcements and the Planned Activities portion of events. CKEditor upgraded and Source button reinstated. Pack 1776 of Mount Sinai, New York! We love the home page graphics on this site, which grab your attention right away. The other pages are nicely fleshed out as well, with plenty of forms and links to other sites. 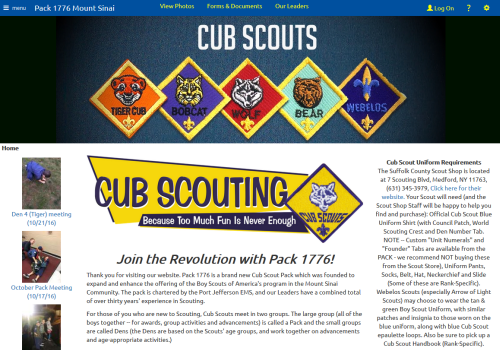 This site is surely a valuable resource for all the members of Pack 1776.